Cam Smith flings a ball toward home for the Patriots in their 10-5 win over the Norsemen. OLD ORCHARD BEACH – The Patriots and the Norsemen, two members of the Greater Northeast Collegiate Baseball League (GNCBL), faced off at the Ballpark on Sunday afternoon, July 9, with the Patriots emerging the 10-5 victors in the end. Practically the entire Patriots lineup rounded the bases at least once, and Tanner Laberge (Windham, USM) added a two-run homer for the team in the bottom of the fifth for arguably the prettiest hit in an afternoon full of pretty hits. The GNCBL, billed as “Northern New England’s Newest Place for College Summer Baseball,” is midway through its inaugural season. The League seems to have kicked things off right, having attracted plenty of talent and constructed four strong squads: The Nor’easters and the Spartans, and (obviously) the Patriots and the Norsemen. The teams don’t just play one another, though; they frequently match up with opponents from other leagues. Sunday’s win bumped the Patriots to 6-4. As they’d dropped a pair of bouts to the Norsemen earlier in the summer, the triumph was especially gratifying. The Norsemen jumped out to a 2-1 lead in the top of the second on a two-RBI homer by Amos Herrin (Wilton, SMCC). Heath took a moment to praise Herrin’s play, both at the plate and on the mound. But the Patriots battled back in the bottom of the second, Drew Abramson (South Portland, Bentley) and Troiano both rounding to home when Jared Gagne (Dover, NH; St. Joe’s) drove a double to left-center. The team then added three more in the bottom of the third: Kip Richard (Kennebunk, USM) and Anthony Degifico (South Portland, USM) logged back-to-back doubles and Abramson logged a single to grind around the bases and really seize the momentum for the Patriots at 6-2. One bad play or one bad stretch can get inside a team’s collective and throw them all off, of course, but the Norsemen seemed mostly to keep their cool. Heath emphasized that his squad tries to adopt a one-pitch-at-a-time mindset, and usually succeeds. Both teams had a quiet fourth, but the Patriots struck again in the fifth, tallying another trio of runs. Degifico singled to start things off, after which Laberge stepped to the plate and volleyed his homer into the woods beyond the left-field wall. Three batters later, Dylan Turner (Gorham, St. Anselm’s), singled into center-left, but reached second on an 8-5 fielder’s choice that caught Abramson – ahead of him on the bases – out at third. Turner then scored when Troiano blasted a deep centerfield double. 9-2. The opponents traded runs in the sixth: Andrew Hillier (Bangor, USM) scored for the Norsemen in the top of the inning and Richard scored again in the Patriots’ ups. It would be the Patriots’ final run of the afternoon. For their part, the Norsemen notched two more – Hillier in the eighth and Connor McGuire (Ellsworth, Husson) in the ninth – but ultimately, the team had simply fallen too far behind though the first half of the contest. 10-5 the final. Cam Smith (Gorham, Clark) started on the mound for Patriots, throwing three innings. “Cam came in and threw through four innings, did great,” Wood said. But Smith wasn’t the only Patriot to take to the mound on Sunday: Laberge, Troiano, Quintal and Chris States all threw too. Herrin began the day hurling for the Norsemen; Kevin Carter (Bowdoinham, UMF) relieved him in the fourth. Ethan Nash (Westbrook, UMF) and Brandon Hubbard (New Gloucester, Thomas) also took to the mound for the team. 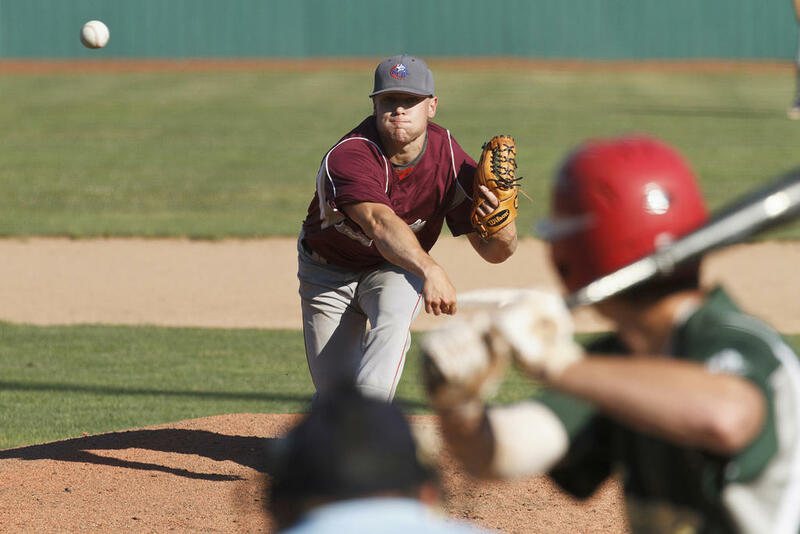 The Greater Northeast Collegiate Baseball League plays seven-inning games on Tuesdays and Thursdays and nine-inning games on Sundays. The outfit is online at www.gncbl.net; they’re on Twitter at @GNCBLBaseball, and they’re easily searchable on Facebook. Tanner Laberge approaches home after blasting a two shot over the leftfield wall. Ethan Nash throws for the Norsemen in their loss to the Patriots. Tanner Laberge takes a turn on the mound for the Patriots. Brandon Hubbard takes a turn on the mound for the Norsemen. Dylan Turner reels in a pitch, working behind the plate for the Patriots.